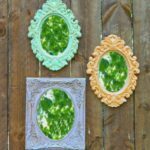 Looking for 4th of July crafts for kids or for yourself? When I think of 4th of July, I think of a beautiful breezy and warm day. So a stars-and-stripes wind chime seemed like a perfect 4th of July craft for kids. Here’s how it’s made. 1. If using salt clay, make the clay. Use your fingers, a rolling pin, or a piece of PVC pile to roll out the clay to about 1/4″ thick. 2. Cut a 1-1/2″ x 6″ piece of clay to form the main support of the wind chime. From the remaining clay, cut 3 stars and 4 wavy strips of clay about 3/4″ x 4″. 3. Along the top long edge of the main support, use a toothpick to make a hole about 1/4″ in from each top corner. Evenly space 7 holes along the bottom long edge of the main support. Use a toothpick to put a hole in one point of each star and at the top of each wavy strip. 4. 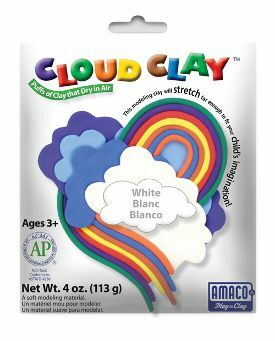 If using air-dry clay, dry clay pieces according to manufacturer’s instructions. If using salt clay, place clay on ungreased baking sheet in a 250 degree oven for about 2 hours, then let the pieces cool completely. 5. Use acrylic paints to paint the stars and wavy stripes as desired. Before the paint dries, make sure to clear any paint out of the hole–the same toothpick can be used for that. 6. Cut pieces of fishing line: two 7″ piece, two 9″ pieces, two 11″ pieces and an 13″ piece. Arrange the clay stars and wavy stripes along the bottom edge of the main support as desired. Starting with the center chime, string the chime on the 13″ piece of fishing line and then thread one end of the fishing line through the center hole on the main support. Knot the ends of the fishing line together. Working out from the center, attach the next two chimes using the 11″ fishing line, the next two with the 9″ pieces of fishing line, and finally, the two end chimes with the 7″ fishing line. 7. Cut an 18″ piece of fishing line. Put one end through the hole in one corner and the other end through the hole in the other corner. Bring the ends together and tie them together with a good overhand knot. Hang the wind chime from this doubled length of fishing line. 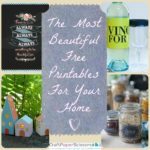 For some other 4th of July projects, we’ve got some round-ups that will definitely inspire. 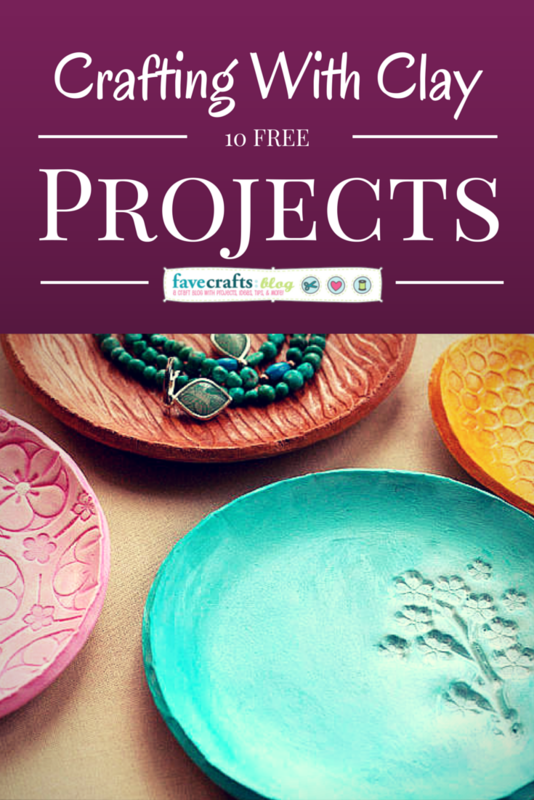 And though the projects in our new eBook, 4th of July Crafts: Blogger Edition 2010, focuses on more than just kids crafts, there are some great craft projects for kids in there as well. This band of non-toxic air-dry clay stretches farther than any other brand; not breaking, cracking, or pulling apart. 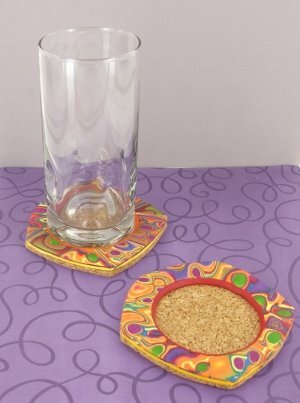 It dries in 24 hours and comes in a wonderful assortment of bold bright colors. Learn more and enter to win here. Contest ends July 2, 2010. You can enter once daily, so return often to improve your chances of winning! Clay artist Marie Segal put together this great kit to create her favorite Glitter Flowers. 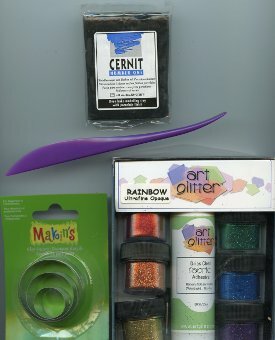 The kit includes Cernit clay, glitter, adhesive, clay cutters and more. 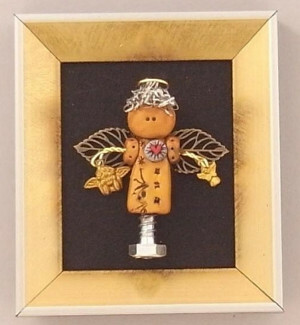 Use the kit to create a jewelry pedant or embellishment for a picture frame. Read the full review here and enter to win the kit here. Contest ends December 25, 2009. You can enter once daily, so return often to improve your chances of winning! Metal clay can be used in the same way as polymer clay, but once fired, metal clay leaves only the metal behind (silver, bronze or copper). 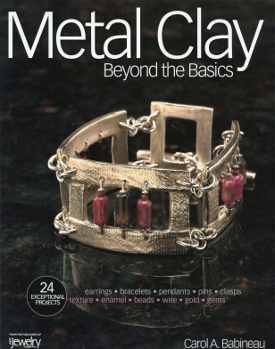 This book features 24 suberb jewelry projects using metal clay, including earrings, pins, pendants and more. Read the full review and enter to win a copy here. Contest ends December 15, 2009. You can enter once daily, so return often to improve your chances of winning! 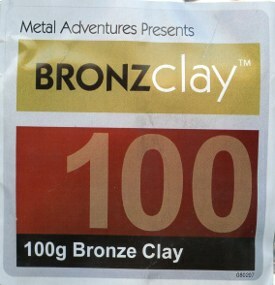 Once fired, the clay median BronzClay™ becomes a solid bronze creation. The bonding materials of the clay completely vaporize during firing. The manufacturer, Rio Grande also makes a CopprClay™. You can use the same tools as you would for any other kind of clay but end up with a solid bronze creation! Learn more and enter to win the clay here. Contest ends November 27, 2009. You can enter once daily, so return often to improve your chances of winning! 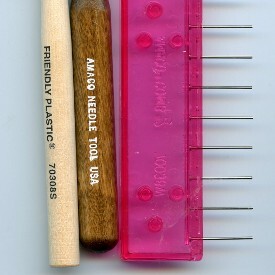 AMACO has sent us 3 great tools for working with friendly plastic, clay and even paint: Marbling Comb, Needle Tool, Wood Sculpting Tool. The marbling tool allows you to make swirls and other patterns easily. The needle tool and the wood sculpting tool both allow you to manipulate the materials. 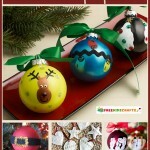 These are great for clay artists and those interesting in jewelry craft. Learn more and enter to win here. Contest ends October 16, 2009. You can enter once daily, so return often to improve your chances of winning! 1. Nub Horns – (kind of like a goat or the stereotypical devil horn) I roll the clay into a ball and cut it in half; that gives me my wide base and the top surface is roughly in the shape I’m going to want it to be in when I’m finished. Then I take the ball half and start pressing and pulling gently on the top in one direction until it narrow into a nub. 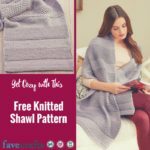 The top can be rounded or pointed, depending on the look you want to go for, just use your fingers to shape until you reach the desired effect. 2. Curved Horns – Start with a rope, instead of a ball. Keep it kind of thick, at least at the base end and roll it a little bit into a cone shape, letting it narrow as desired, with the tip either rounded or pointed according to the effect you want to achieve. 3. Ram’s Horns – Start with a rope, instead of a ball. Keep it kind of thick, at least at the base end and roll it a little bit into a cone shape. Hold the base gently in your one hand, not too hard, then with your other hand twist the clay while at the same time pulling slightly. The tip will spiral and narrow to a point. While you are twisting, let the horn curve under as well, with the tip either staying in a flat curl or tugging it out slightly so they point out. Once you have your shape use your clay knife to slice the base at an angle from front to back. 4. Spiral Horns – Follow the above directions only do not curve the horn as it is spiraling. 5. 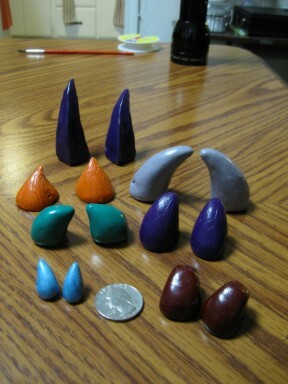 Unicorn Horns – make one spiral horn only in a larger scale. Watch where you put the holes for the elastic and don’t make the horn too big because balance can be an issue. 6. Cat’s Ears – start with half a ball and work with the clay, pressing your finger in until you end up with a roughly cat-shaped ear where the front edge is a little fuller and the outside edge is flat. Take a bit of white or beige clay and add it to the depression, working the edges until the two clays mix on the outside edge. Follow the rest of the above directions in regards to drilling the hole, texturing, and glazing. When you make the second ear, make sure it is a close approximation of a mirror image to the first ear. 1. Try mixing different colors for more interesting effects, particularly when making spiral horns, though the swirling/marbling effect on smooth horns is interesting as well. 2. 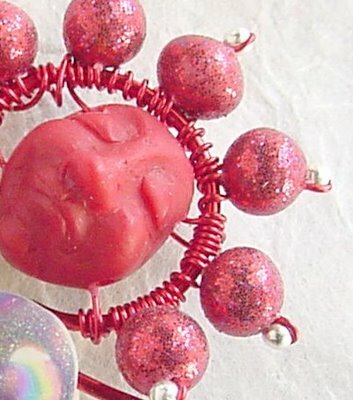 Experiment with embellishing…glitter, beads, bells, many small craft items can be adapted to make more elaborate horns. 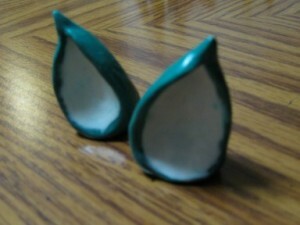 Embed them while you are making the horns or attach them after you have baked them, depends on the effect you are after. 3. Play with textures. 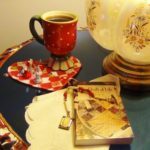 It can be as simple as purposely overlapping your own fingerprints lightly on the surface of a horn or pressing a textured cloth or other item into the clay after you have the shape you are looking for. Another technique is to take your skewer or a toothpick and drag it through the clay to create patterns or lines to mimic natural horns. I have in the past rolled particularly malleable horns in glass microbeads. Sometime the beads stick after baking, sometimes they come off the minute you touch them, but once they harden you are left with either a rough, jeweled surface or (if they come off) an interesting pebbled texture to the surface of your horn. You can even engrave initials in the base, but do it deep because it will bake in a bit. 1. Keep in mind, with this hand-crafted item the adage no two are alike is quite applicable. Don’t let yourself get frustrated. Strive for similarity, but if you end up with two vastly different patterns rework the clay and try again. 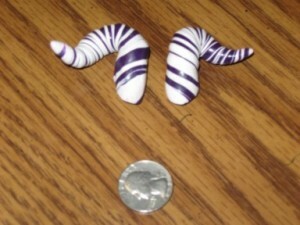 This is of a particular issue with mixed color spiral horns or rams horns. 2. When creating the hole for the elastic make sure the tool goes straight through and is reasonably placed in the same spot on both horns or they will not sit in the same orientation when you are wearing them. 3. 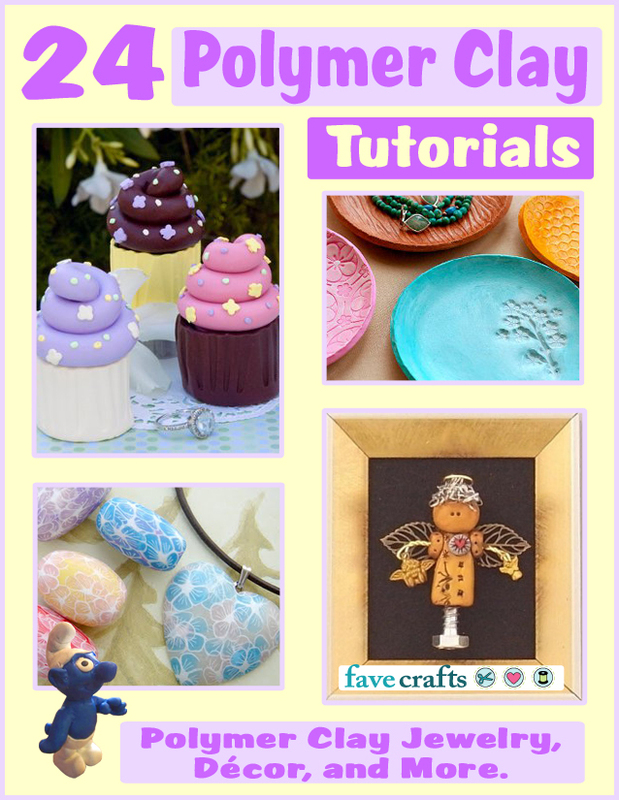 Polymer clay is known for breaking, particularly delicate pieces. Should the tip of your horn break off use a bit of superglue to reattach the segments. In most instances it won’t even be visible. 1. 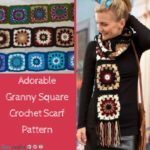 Some brand names are SculpeyIII, Premo, and Fimo, though some craft stores have begun producing their own store brand. Comes in solids, metallics, pearls, and effects, including glitter and glow-in-the-dark. 2. Premo and some solid colors are firmer and take longer to knead into a malleable state. If the clay is too firm when you try and work with it, it will crack instead of stretching as you roll or flatten it. 3. SculpeyIII pearl colors are often too easily worked. If the clay too soft it will not hold its shape as well but will hold fingerprints extremely well. If the clay gets too malleable set it aside and let it be awhile. It will harden a little and be easier to work with later. 4. 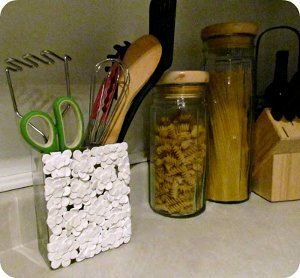 When working with more than one color scrape your work surface with the edge of your clay knife to scrape up any residue and then wipe firmly with a paper towel to minimize unwanted color transfer. 5. Do not grip your clay too firmly or the shape will deform or fingerprints will set. If you have fingerprints you need to get rid of and your horn is smooth surface just roll the clay gently on your work surface, but not too much or you will change the shape. You can also smooth out the fingerprints by lightly drawing your fingers over the space but not pressing down. 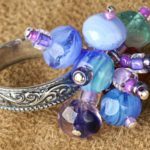 With polymer clay it is difficult to avoid all fingerprints, but many of them will lessen or disappear altogether in the baking process. 6. 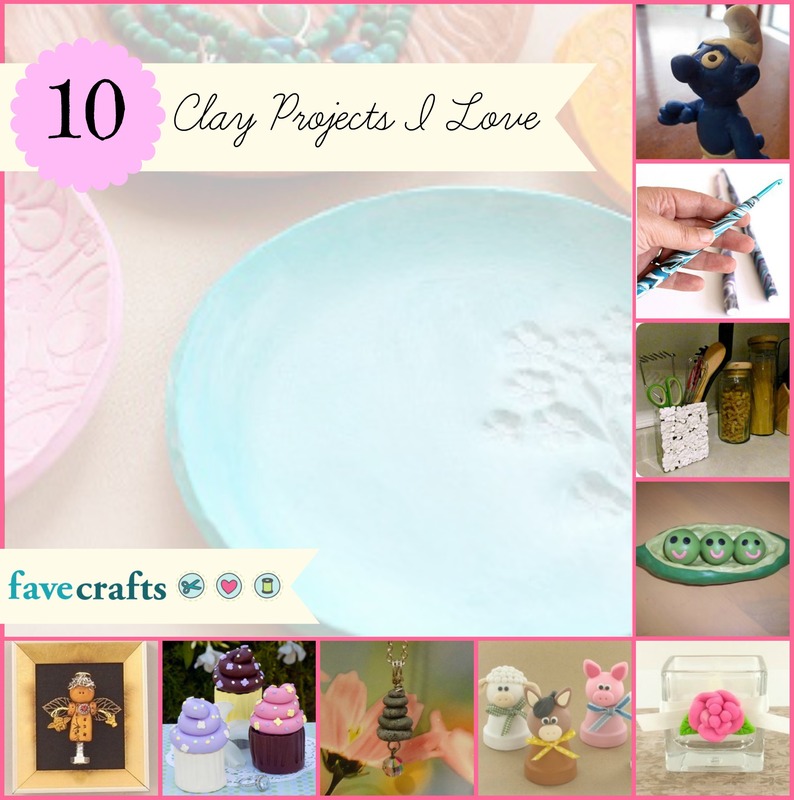 It has been my experience that the white clay is a dull color and does not bake very bright. I tend only to use it if I swirl colors. If you want a brilliant white and don’t mind some sparklies (and if you can find it) I recommend using Femo Special Effect in white glitter. It stays an almost glowing white and the glitter is the translucent type, not the metallic type so it produces a gorgeous effect. Please note that certain colors will transfer to your skin and work surface more readily than others. Any red, some of the metallic blues or deep purple, the metallic gold (which can make some nice effects on any horn you create after that), so keep this in mind when working clay on your work surface or if you are making multiple sets at once in different colors. Always leave the red for last, do the lighter colors first, and wash your hands in between if color transfer is an issue. Be sure to check out her basic horns too!